Everyone. I think you should congratulate Robert who won the giveaway because I rolled a dice and he won. But enough about him. This site is about drawing chickens... and right now Dice. Dice that are chickens! Okay. I even have a game set up for this. Required: 1 six-sided die, or 1 Special-Made ChickenMaker™ Chicken Rolls Die. A sheet of paper and pen or pencil. Playing the Game: Players take turns rolling the die counterclockwise from the player who started. Record what is rolled unless it is an egg, in which case the player receives nothing for that turn. Winning the Game: To win the game the player must have 2 Eyes, 1 Wattle, 2 Feet, 1 Beak and 1 Comb then roll an egg. 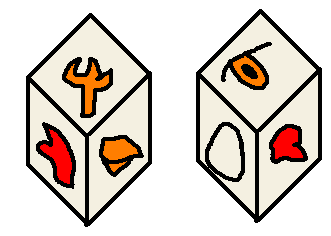 More Dice: Using multiple dice for each roll can make the game run faster, but removes much of the tension from play. Egg Wins: If you roll an egg at any point you win. You can also win my assembling 1 Eye, 1 Wattle, 1 Foot, 1 Beak, and 1 Comb. Less Parts: Under this variant rule the wattle and comb are replaced by a second eye and foot, respectively. They are also removed from the win conditions. And I'm gonna straight up make this die. I'm pretty sure I can get a blank d6 at the local comic shop. That will also be posted on this site of course. Probably won't be colored though. That is genius. I love it.